1 Auriok Glaivemaster 2,- Foil! 2 Echoing Calm 3,- Foil! 3 Emissary of Hope 4,- Foil! 5 Leonin Battlemage 4,- Foil! 7 Loxodon Mystic 2,- Foil! 8 Metal Fatigue 2,- Foil! 10 Pteron Ghost 2,- Foil! 13 Ritual of Restoration 2,- Foil! 15 Steelshaper Apprentice 9,- Foil! 16 Stir the Pride 3,- Foil! 17 Test of Faith 4,- Foil! 19 Carry Away 4,- Foil! 22 Hoverguard Observer 3,- Foil! 25 Magnetic Flux 2,- Foil! 26 Neurok Prodigy 2,- Foil! 27 Neurok Transmuter 4,- Foil! 28 Psychic Overload 4,- Foil! 30 Quicksilver Behemoth 2,- Foil! 31 Reshape 24,- Ikke på lager! 32 Retract 54,- Ikke på lager! 43 Essence Drain 2,- Foil! 45 Grimclaw Bats 2,- Foil! 46 Hunger of the Nim 2,- Foil! 48 Murderous Spoils 4,- Foil! 49 Nim Abomination 4,- Foil! 51 Scavenging Scarab 2,- Foil! 55 Barbed Lightning 2,- Foil! 56 Crazed Goblin 2,- Foil! 58 Drooling Ogre 2,- Foil! 63 Goblin Archaeologist 4,- Foil! 65 Krark-Clan Stoker 2,- Foil! 67 Savage Beating 20,- Ikke på lager! 70 Tears of Rage 4,- Foil! 72 Vulshok War Boar 3,- Foil! 74 Echoing Courage 2,- Foil! 76 Infested Roothold 4,- Foil! 84 Stand Together 4,- Foil! 85 Tangle Spider 2,- Foil! 87 Tel-Jilad Outrider 2,- Foil! 88 Tel-Jilad Wolf 2,- Foil! 89 Viridian Acolyte 2,- Foil! 90 Viridian Zealot 9,- Foil! 93 Arcane Spyglass 2,- Foil! 95 Arcbound Crusher 4,- Ikke på lager! 96 Arcbound Fiend 4,- Foil! 97 Arcbound Hybrid 2,- Foil! 103 Arcbound Stinger 2,- Foil! 104 Arcbound Worker 4,- Ikke på lager! 105 Auriok Siege Sled 4,- Foil! 106 Chimeric Egg 4,- Foil! 109 Darksteel Colossus 51,- Ikke på lager! Foil! 110 Darksteel Forge 71,- Ikke på lager! 120 Eater of Days 17,- Foil! 121 Gemini Engine 9,- Foil! 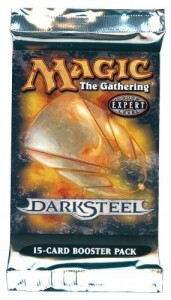 131 Myr Landshaper 2,- Foil! 137 Razor Golem 2,- Foil! 138 Serum Powder 24,- Ikke på lager! 140 Skullclamp 19,- Ikke på lager! 142 Specter's Shroud 4,- Foil! 148 Sword of Fire and Ice 249,- Foil! 149 Sword of Light and Shadow 177,- Ikke på lager! 151 Tangle Golem 2,- Foil! 155 Ur-Golem's Eye 2,- Foil! 161 Wirefly Hive 5,- Foil!